The tiny Charlotte Bronte manuscript which sold for a record £690,850. (Click on image to enlarge). 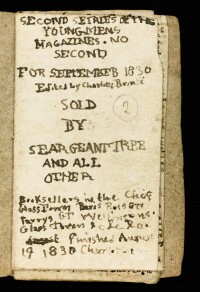 There was a new record at auction for a manuscript by Charlotte Bronte at Sotheby’s in London today. Her miniature autograph manuscript, written when she was 14 and dated 1830, sold for £690,850. 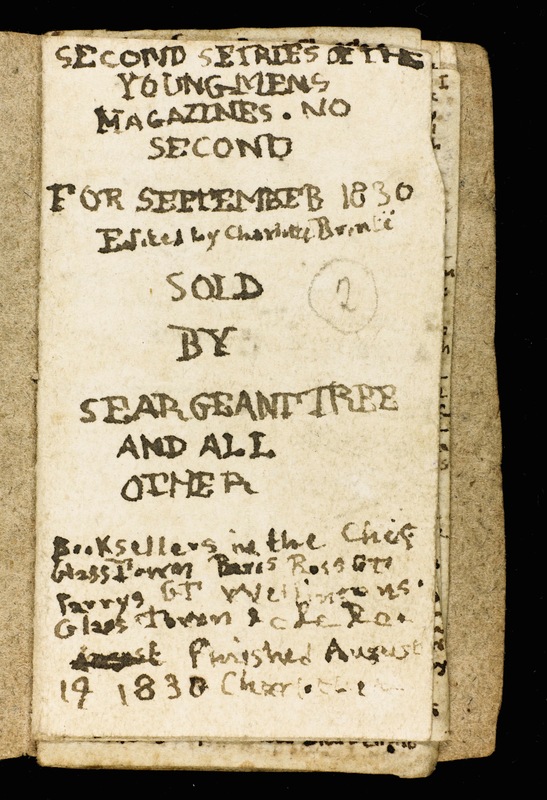 More than twice the pre-sale estimate, this is a record at auction for a literary work by any of the Bronte sisters. Sotheby’s had billed it as the most important Bronte manuscript to appear at auction in more than 30 years. Set in the earliest fictional world created by the Bronte sisters the Young Men’s Magazine No. 2 has never been seen before by scholars. Written in miniature magazine format it was bought by La Musée des Lettres et Manuscrits, Paris, where it will be exhibited in January 2012. Other highlights included Emily Bronte’s Wuthering Heights, 1847, three volumes presented to Ellen Nussey, which sold for £157,250 against an estimate of £70,000-100,000; Charles Darwin’s The Variations of Animals and Plants under Domestication 1868 which made £61,250 (est. £15,000-20,000) and a self portrait by Aubrey Beardsley which made £30,000, double the pre-sale high estimate. (See post on antiquesandartireland.com for November 8). This entry was posted on Thursday, December 15th, 2011 at 1:31 pm	and is filed under AUCTIONS, COLLECTIBLES. You can follow any responses to this entry through the RSS 2.0 feed. Both comments and pings are currently closed.